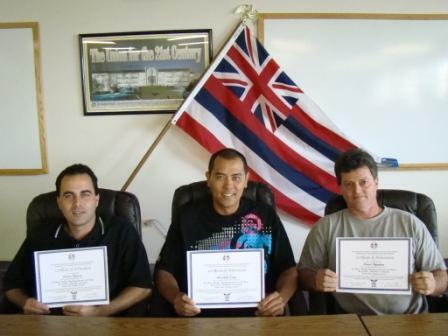 During the week of November 1-5, 2010, three members from IAM District Lodge 142 and Local Lodge 1979 at Hawaiian Airlines – AC/GSE Mechanic’s, completed developing the Hazardous Material AC/GSE Mechanic’s Awareness Training Course Modules at Local Lodge 1979 located in Honolulu, Hawaii. During the week of November 8-12, 2010, three members from IAM District Lodge 142 and Local Lodge 1979 at Hawaiian Airlines – AC/GSE Mechanic’s, completed the Hazardous Material AC/GSE Mechanic’s Awareness Training Train-the-Trainer Course at Local Lodge 1979 located in Honolulu, Hawaii. The Train-The-Trainer course was developed by IAM CREST in cooperation with IAM AC/GSE Mechanic’s and Hawaiian Airlines specifically to enhance the required dangerous goods training provided by Hawaiian Airlines. After successfully completing the course these IAM CREST DOT Associate Instructors will be authorized to deliver Awareness Training to workers who handle dangerous goods by air. Training of DOT HMAT Associate Instructors and workers who handle hazardous materials is funded under a grant by the DOT Pipeline and Hazardous Material Safety Administration. During the week of November 1-5, 2010, five members from IAM District Lodge 141 at Hawaiian Airlines – Operations, completed the Hazardous Material Awareness Training Train-the-Trainer Course at Local Lodge 1979 located in Honolulu, Hawaii.